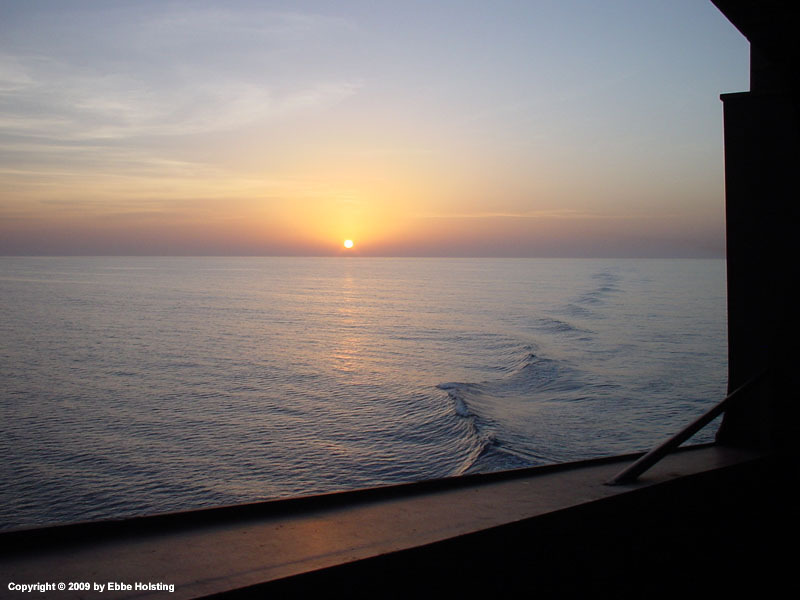 During the 2009 summer break from the Senior Officer education, I again opted to go to sea for 6 weeks as I had done the year before. 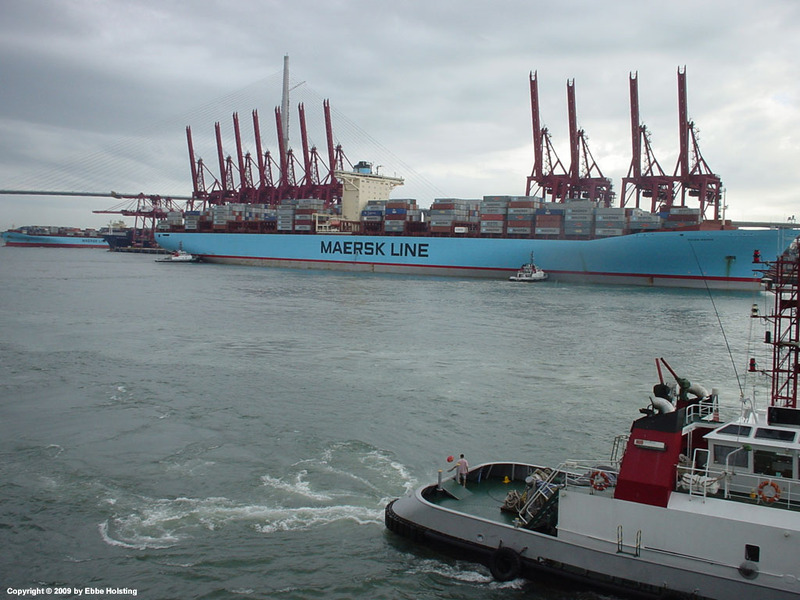 I was assigned to the container ship Axel Maersk, a vessel I knew as I had sailed with her once before, in the summer of 2007 as my last ship before I went ashore to commence the Senior Officer education. This time though, I would not be working solely as a regular officer, as I was signed on as a Designated Training Officer, responsible for the training of the onboard cadets. 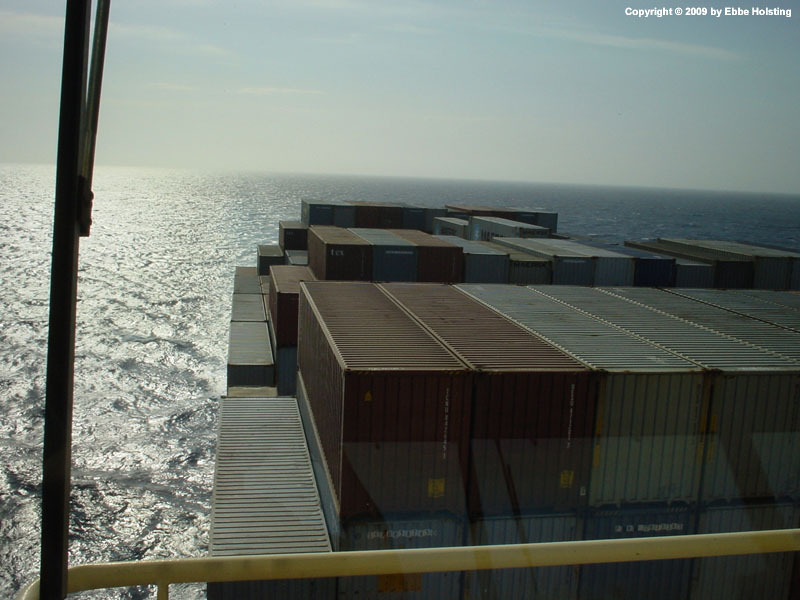 Cruising along in calm seas with the foredeck well loaded with containers. 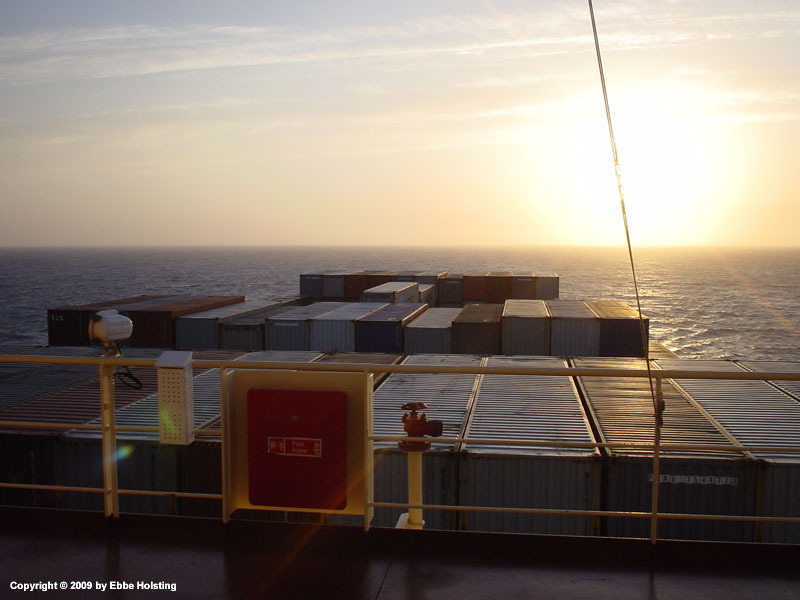 A container ship's container capacity is given in TEU, which is a Twenty-foot Equivalent Unit, i.e. 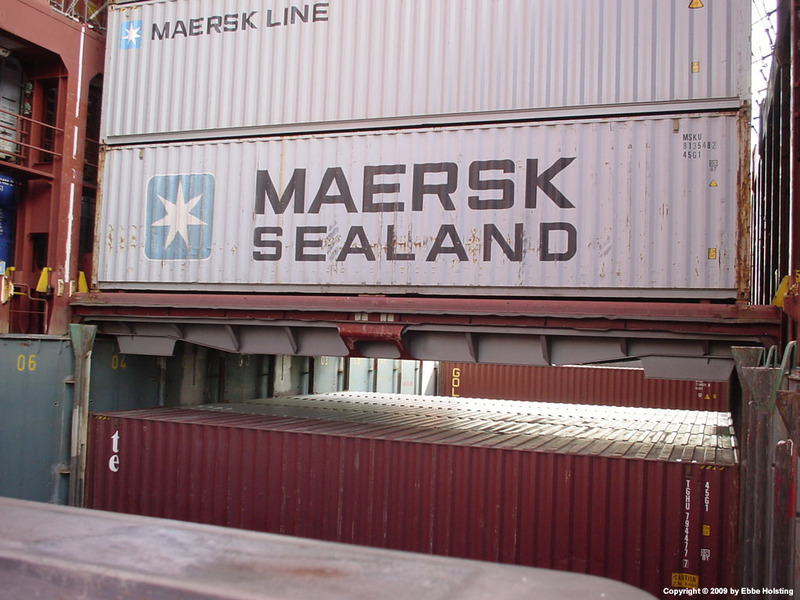 the size of one 20-foot standard container. So the TEU capacity is the number of 20-foot containers that can be loaded onto the ship (theoretically). 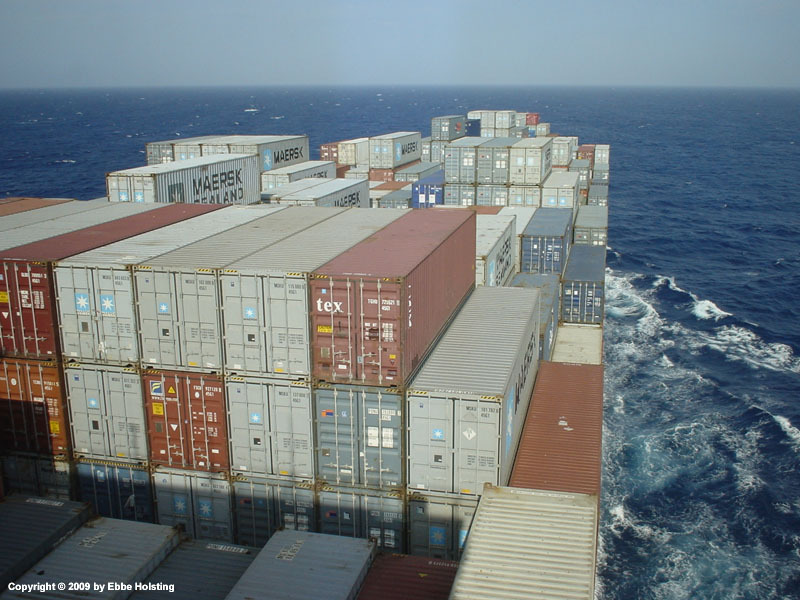 Even so, 40-foot containers make up the majority of shipping containers these days, with maybe as little as 10 percent of the containers loaded on a container ship at any one time being 20-footers. The number might of course be higher for smaller container ships. 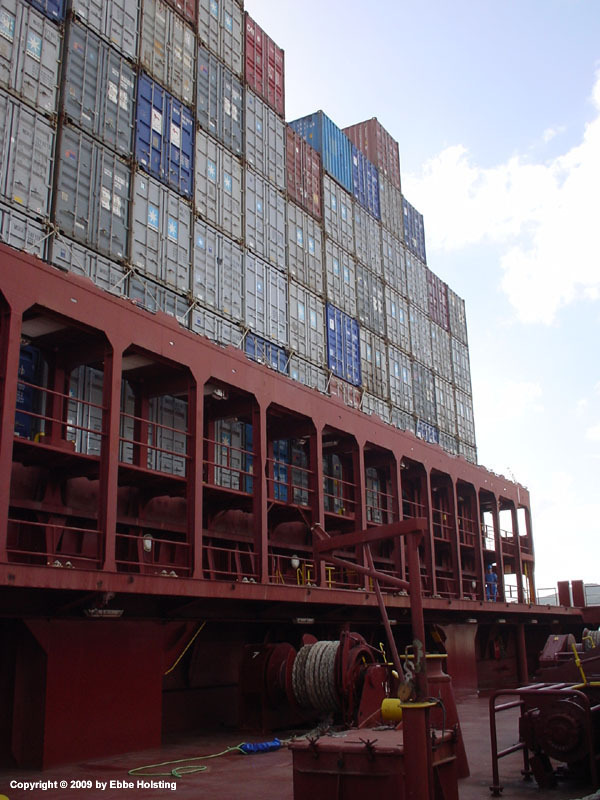 The economical crisis as well as increasing demands for more environmental focus has had a huge impact on shipping. 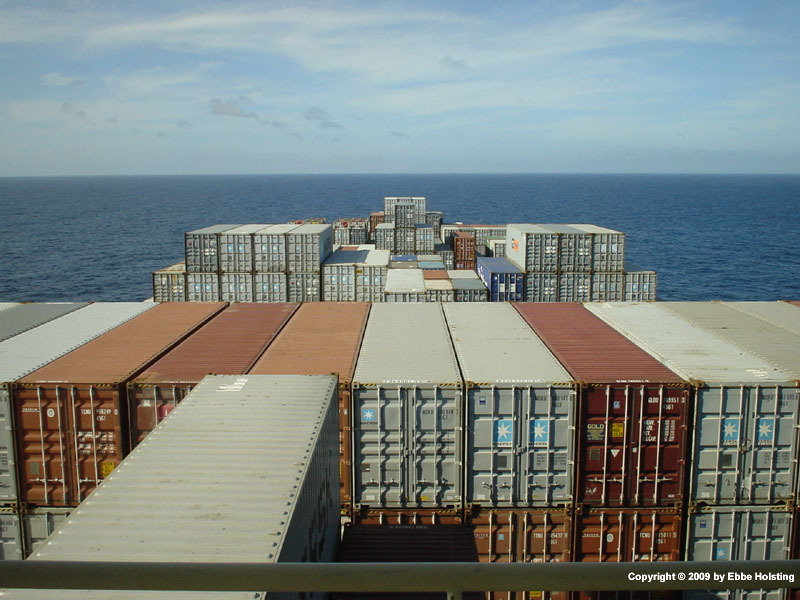 In the late 1990's, speed was everything in the container business, and container ships were designed and built to cruise at speeds up to 25 knots or more. These days ship designers and builders are looking into optimization of container vessel hulls for	operation at much lower speeds, from 16 to 20 knots. This vastly reduces fuel consumption. A view from the forecastle of the ship's bulbous bow, a design feature that improves the aqua dynamics of the ship's hull. 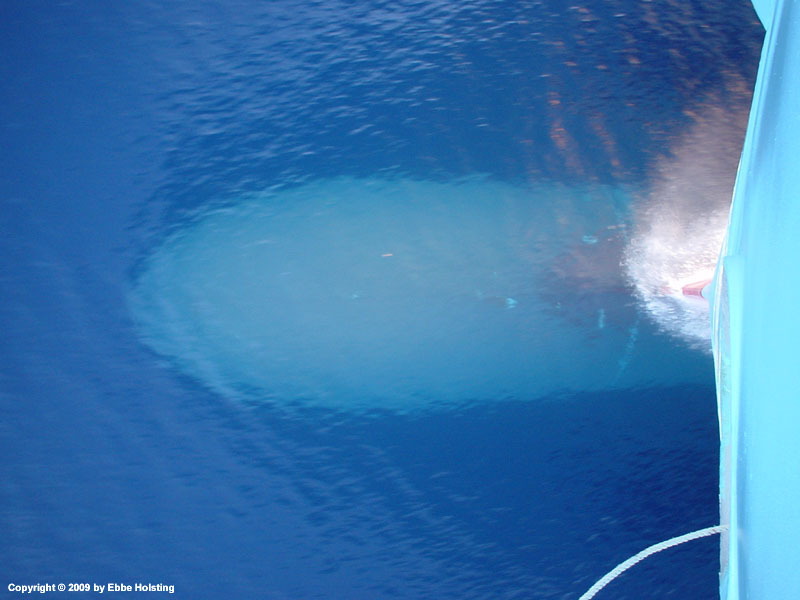 The shape and size of the bulbous bow is determined by, among others, the ship's intended cruising speed and draft. When a ship is powered through water, waves are formed around the hull. 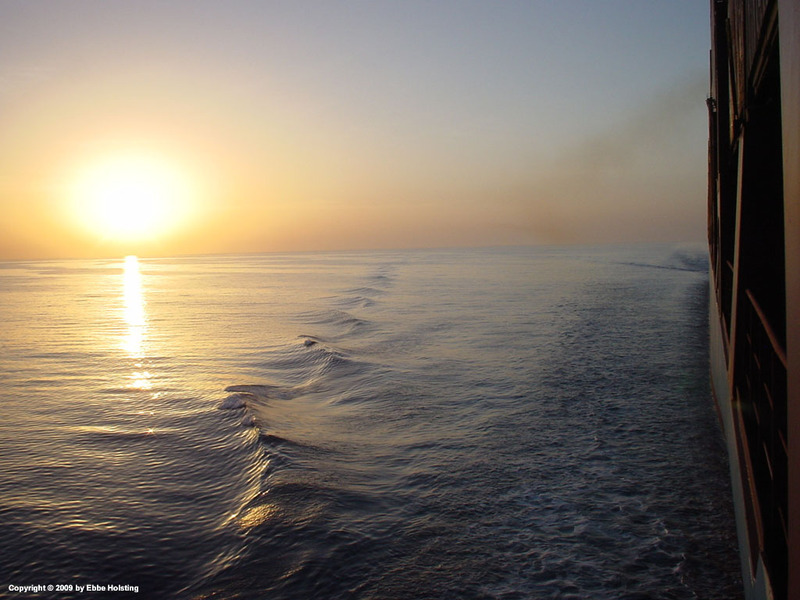 These waves create a drag on the hull, thereby increasing the fuel consumption. The purpose of the bulbous bow is to cancel out these waves, thereby reducing running costs for fuel. 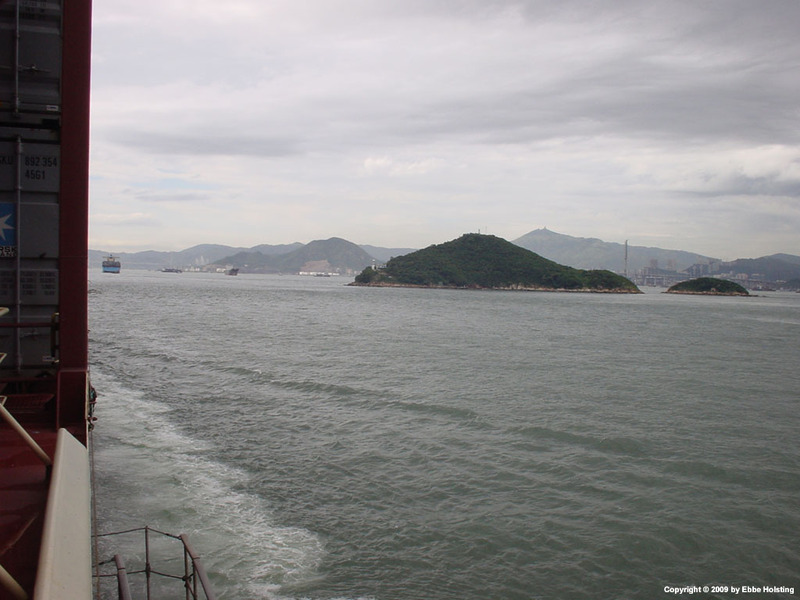 Part of the beautiful approach to the port of Hong Kong. 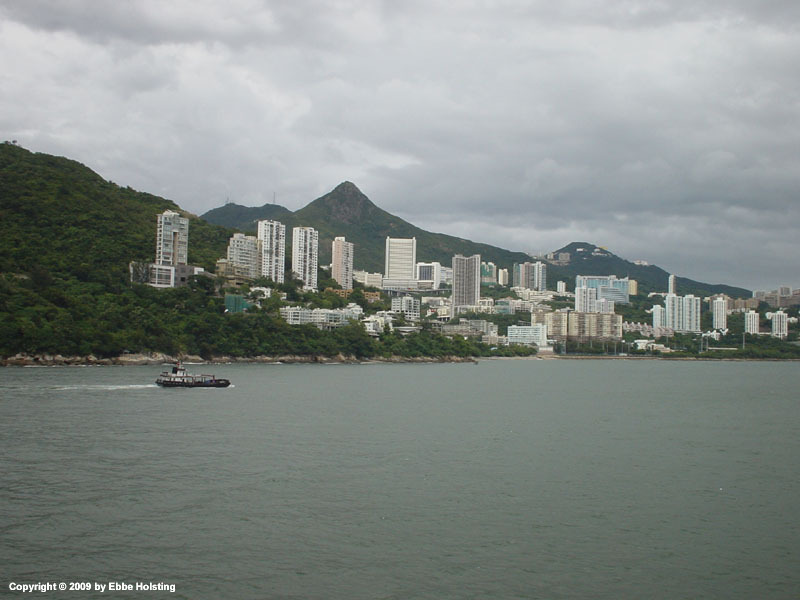 You pass by cliffs, islands and city skylines when approaching Hong Kong. Another Maersk vessel in front of us also en route to Hong Kong. 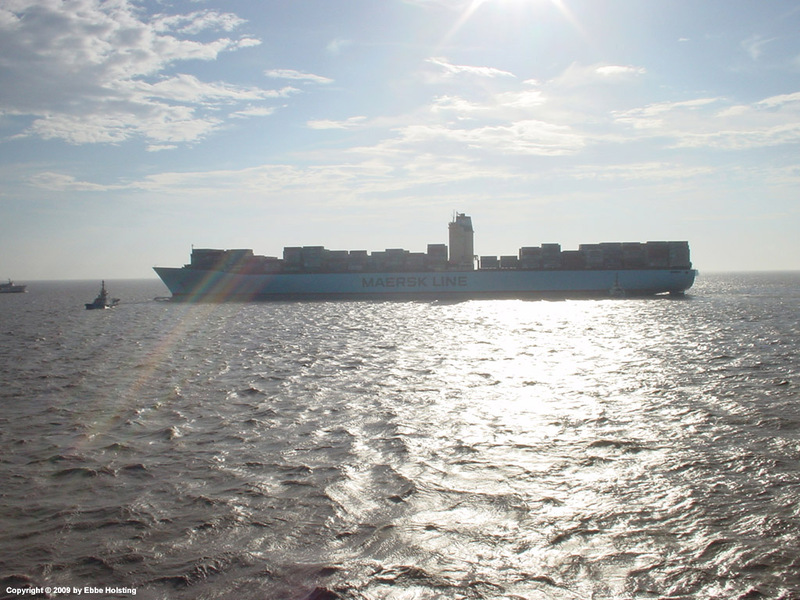 It later turned out to be the Eugen Maersk, one of A. P. Moller - Maersk's E-class container vessels and a sister vessel to the Emma Maersk, the biggest container ship in the world (as of 2009). A Hong Kong suburb, still during approach of Hong Kong. 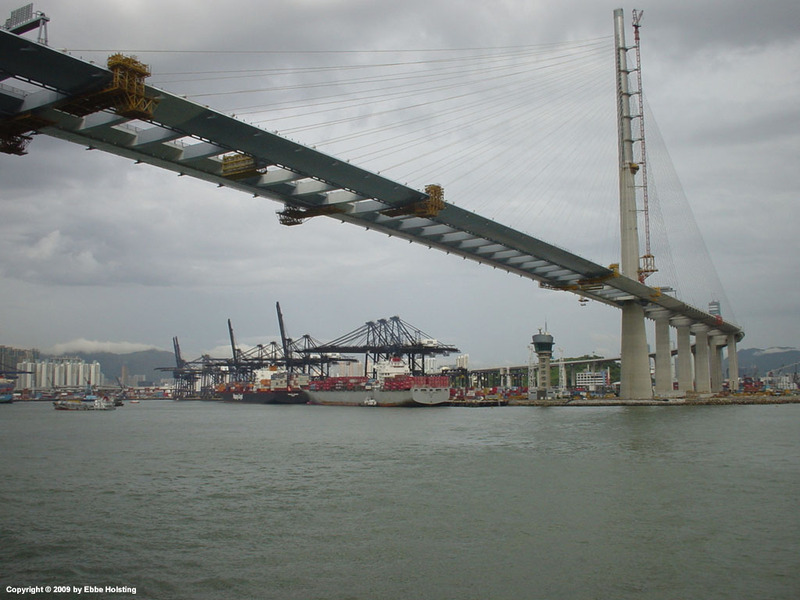 Just entering the harbour basin, passing under a newly built bridge. 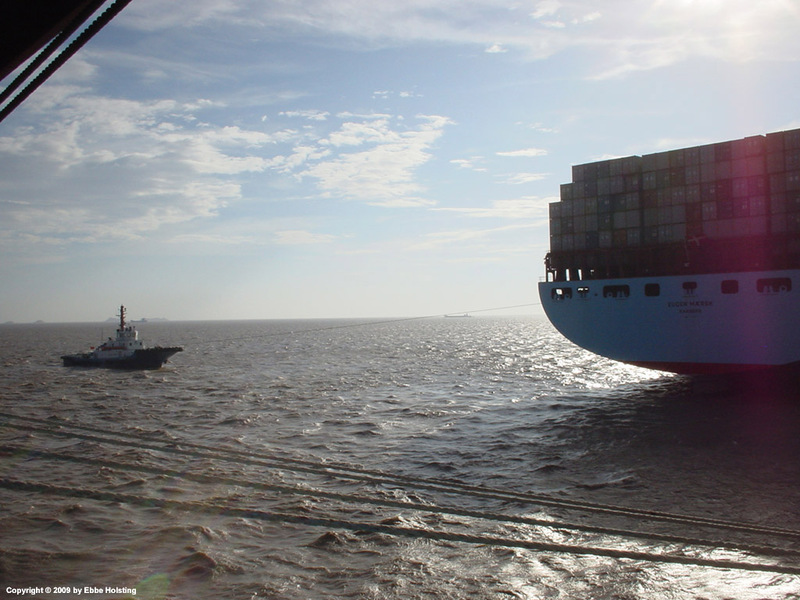 ...and another Maersk vessel following aft of us, here passing through the masses of anchored vessels and smaller river boats. 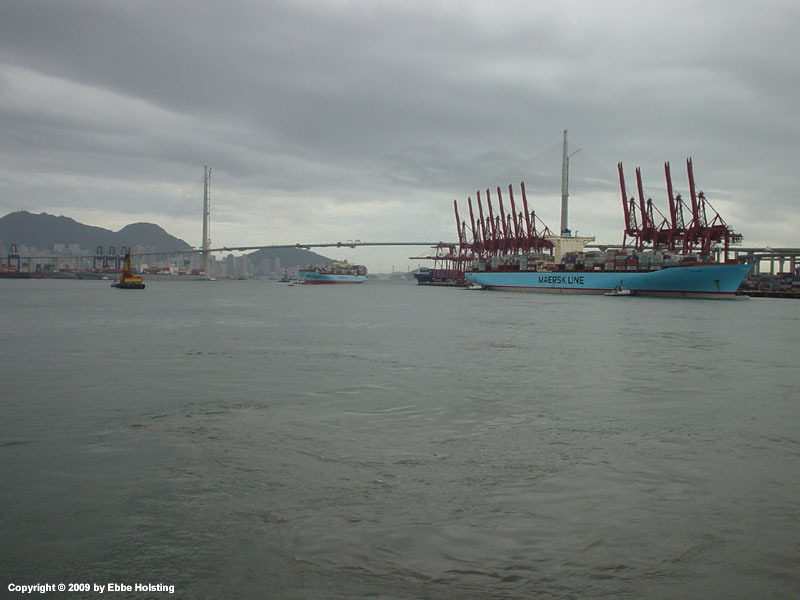 The 399 meter long 14770 TEU container ship Eugen Maersk berthing in Hong Kong, with the other Maersk vessel entering the harbour to the left. 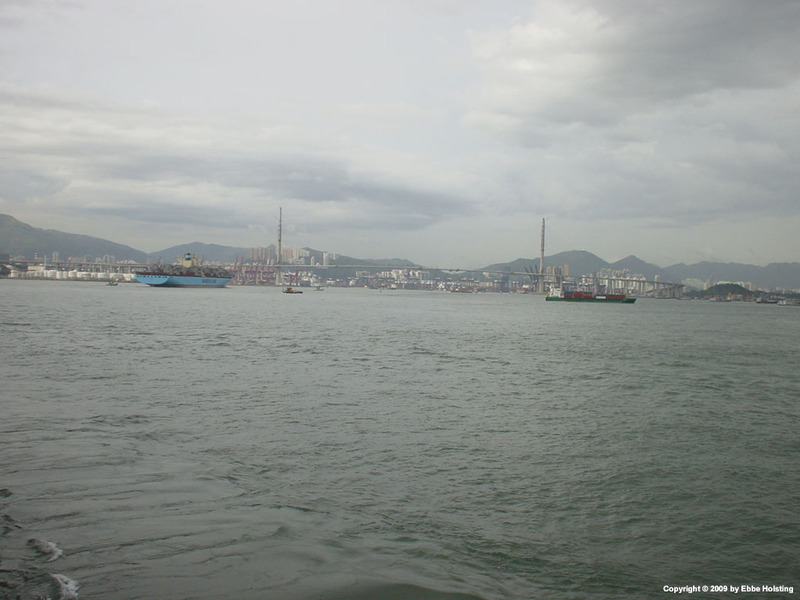 Hong Kong has always been an important port for Maersk Line. 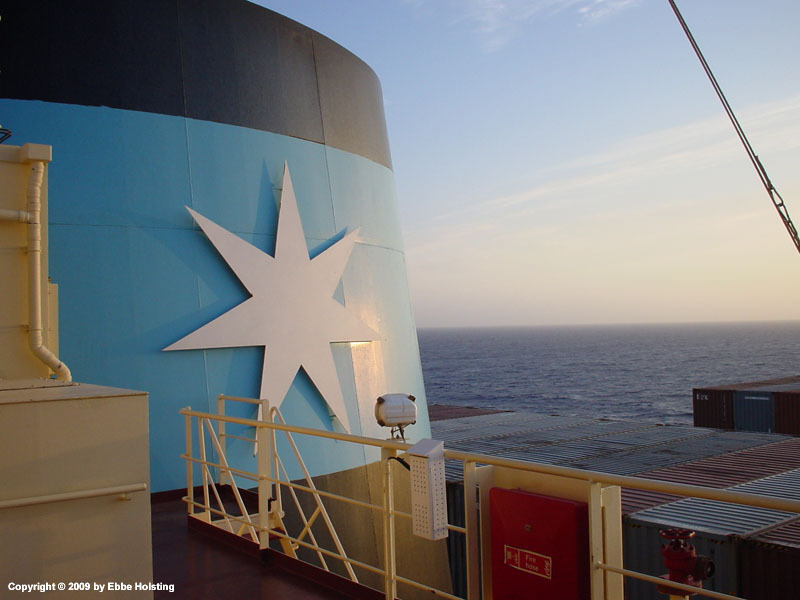 Eugen Maersk mooring up as we pass by headed further into the harbour basin. 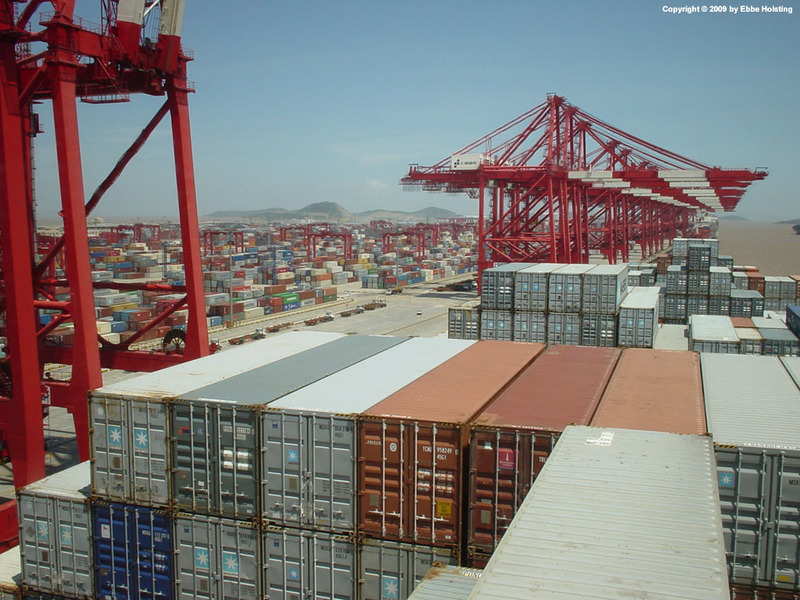 Hong Kong is one of the largest and busiest container ports in the world. A tugboat approaching our port quarter, preparing to assist us in berthing. Tugboats are usually made fast to the ship with large diameter ropes, similar to those used for mooring. Tug boat made fast on starboard side main deck. Using tugboats for assisting in the berthing and unberthing operations is common standard with these huge container ships. In this case, we had two. The other one can be seen at the bow of the ship. 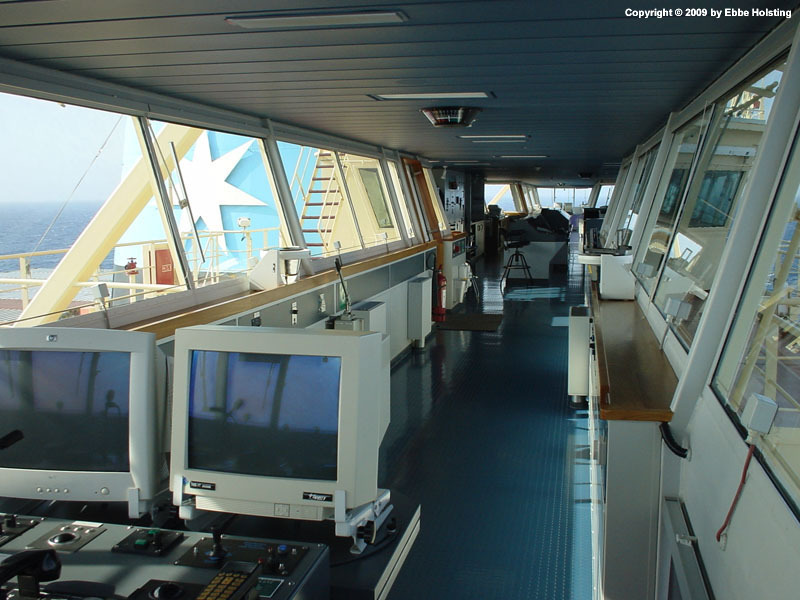 The main console on the navigational bridge. 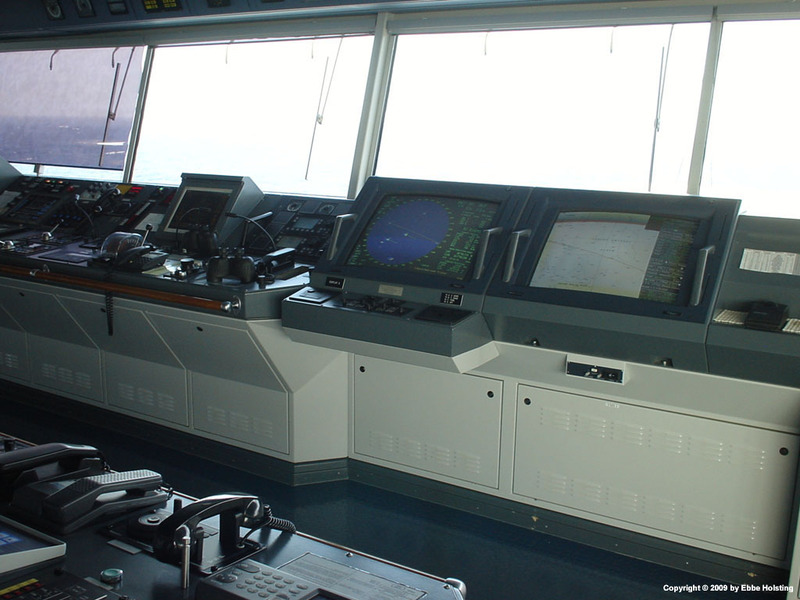 The radar display is seen in the middle of the picture, with the ECDIS - Electronic Chart Display and Information System - to the right. The ECDIS shows an electronic version of the standard paper navigational charts. Even though electronic charts are available for all parts of the world, paper charts are still used in full, both for route planning and position plotting. A view of one of the radar monitors. Our own ship is marked with an arrow (vector) and a longer heading line extending to the end of the radar display. The other yellow dots are other ships (radar echos). 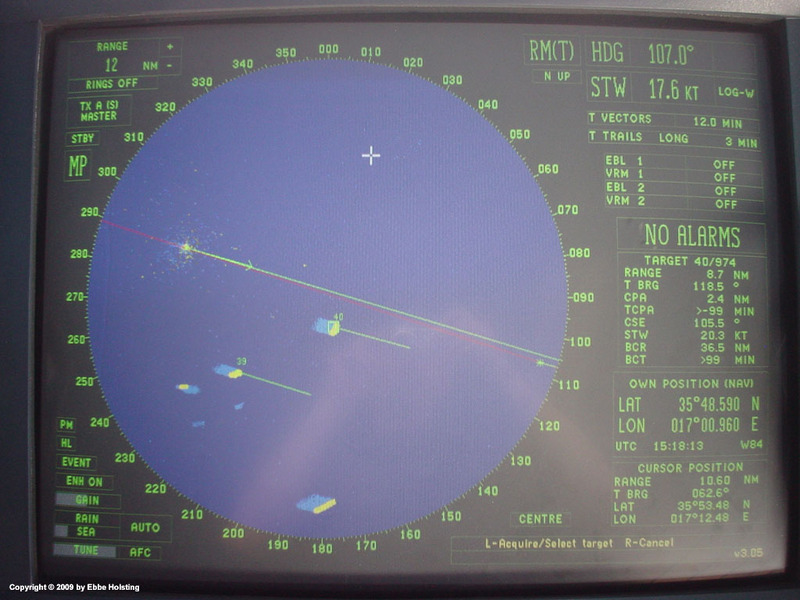 The radar's ARPA system (Automatic Radar Plotting Aid) tracks the other targets and calculates their course and speed. The calculated course and speed of each target (plot) is then represented by a vector. To the right, the calculated data for target no. 40 can be seen, together with the bearing and range. Echos which do not have a vector are simply not plotted by the operator, most likely because they are deemed uninteresting in terms of navigation. Looking to port side from the starboard bridge wing. Both bridge wings are equipped with controls for the main engine, thrusters, rudder etc. as well as a both a radar and ECDIS display (the two visible monitors). 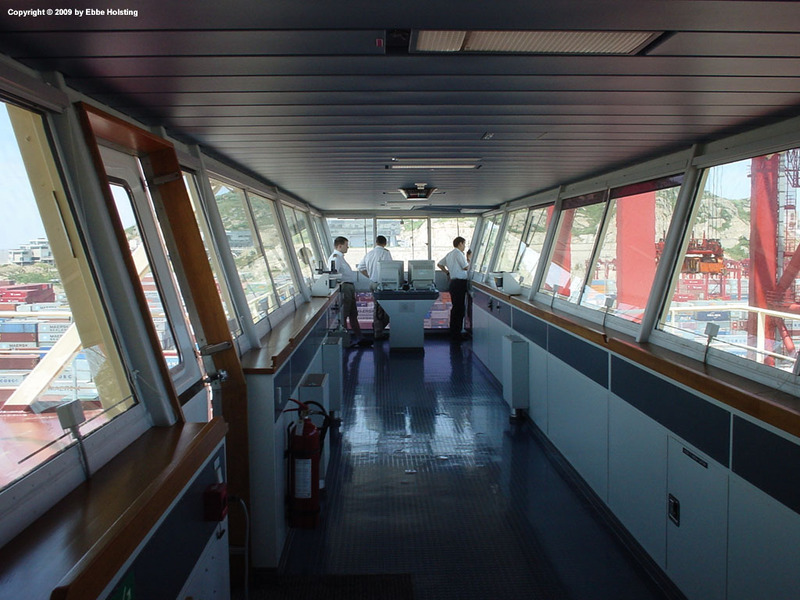 This enables the ship's Captain to manoeuvre the ship from the bridge wings during berthing / unberthing. Looking aft from the bridge deck. The red box contains a fire hose, and boxes like this one are placed all over the ship's exterior and in the engine room. Also note the fire hydrant next to the hose box. Inside the accommodation portable powder extinguishers are located on each deck. Powder extinguishers and foam generating equipment is also found in the engine room, and portable carbon dioxide extinguishers are placed near electrical installations. In addition to these measures, the engine room is equipped with a Fixed CO2 Fire Fighting System, which is capable of filling the entire engine room with carbon dioxide. Still looking aft. 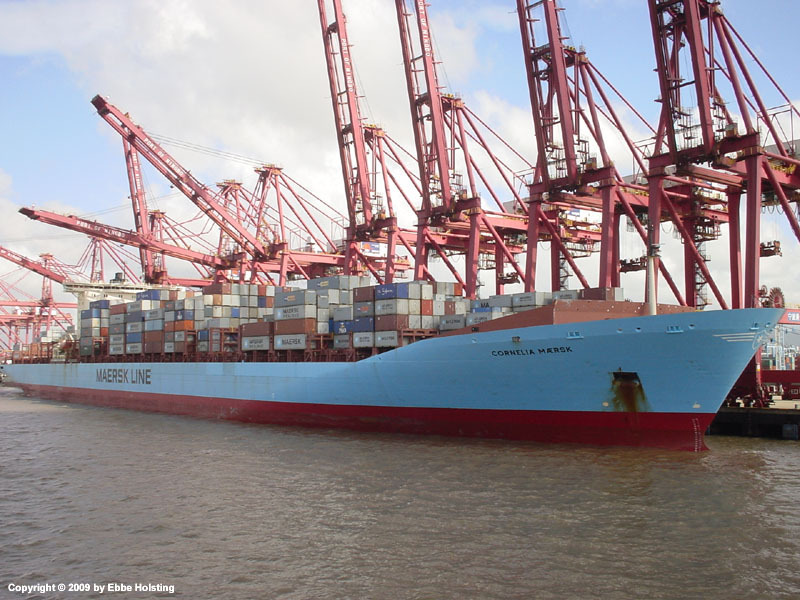 The A. P. Moller - Maersk A-class container vessels have six 40-foot bays aft of the accommodation. 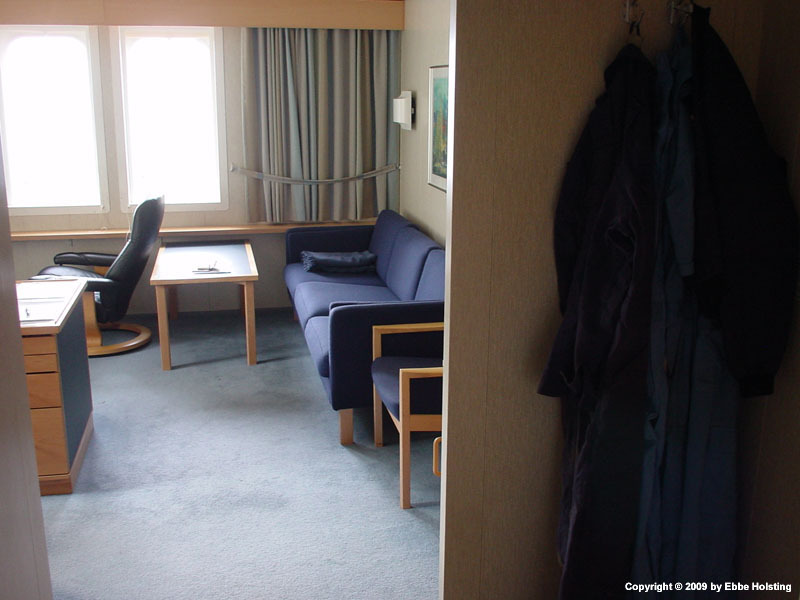 Being the ship's DTO (Designated Training Officer - an extra Officer who's primary responsibily is to plan and supervise the cadets' time on board) I was installed in a rather huge cabin, consisting of a combined office / living room and a separate bedroom. 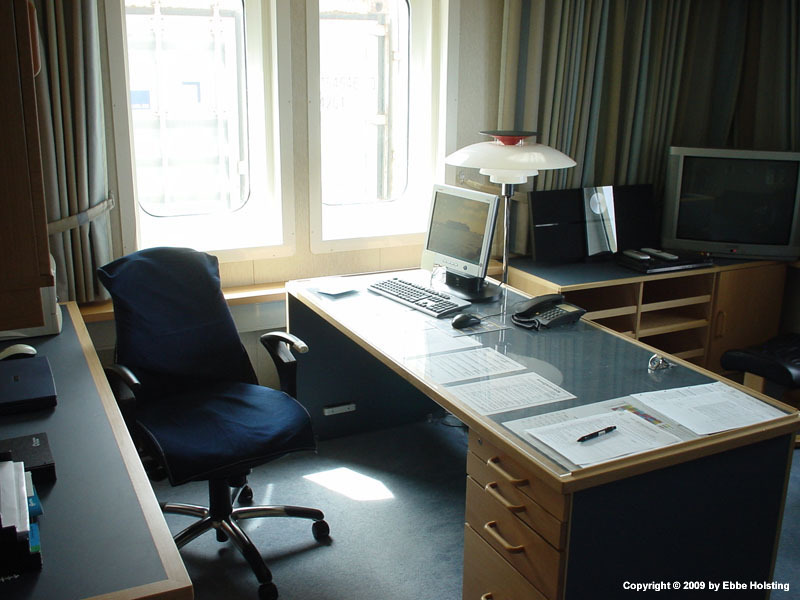 The A-class container vessels are training ships, with cabins for up to 10 cadets and excellent training facilities including a class room, computer cafe and cinema. My job as Training Officer included planning of the cadet's stay onboard, reading and marking of written assignments, class teaching etc. In addition to this I also had "regular" onboard duties, for instance work in the engine room and a 4 hour bridge watch in the afternoon. My bedroom, including a queen size bed. On board these huge vessels, the Captain and Chief Engineer typically have a three-room cabin with separate office, living room and bedroom. Chief Officer and 1st Engineer have a cabin like this one, with combined office / living room and separate bedroom. 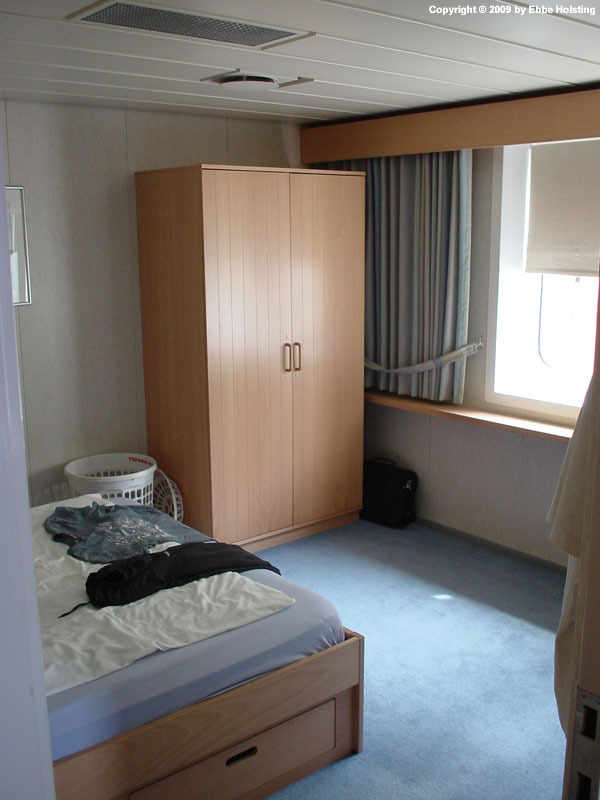 Junior Officers and other crew have a one-room cabin. All crew have their own bathroom with a shower. A view of the living room from the bedroom. 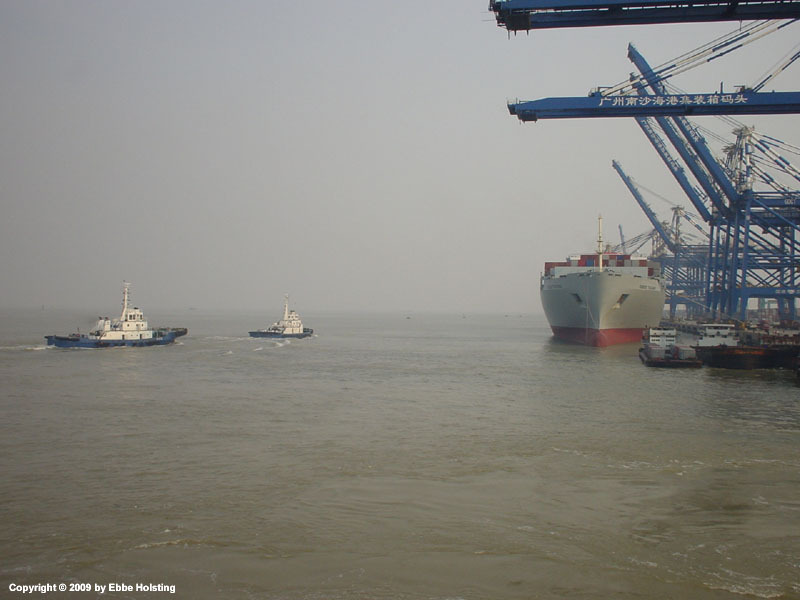 The Chief Officer, Captain and Pilot berthing the ship in the port of Shanghai, China. Both bridge wings are fitted with controls for the main engine, thrusters and rudder, and during berthing and un-berthing the Captain usually does the manoeuvring, guided by the Pilot who is in radio contact with the tugboats. The Chief Officer assists as required. Approaching the pier in Shanghai, China. This terminal is only a couple of years old and, as can be seen in the picture, is quite huge! Containers and gantry cranes as far as the eyes can see. 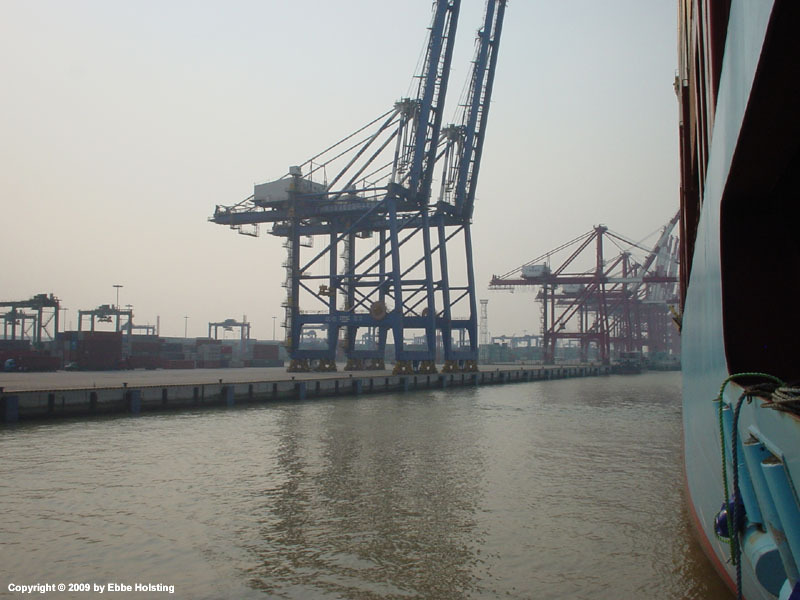 In many of the Chinese ports, here Shanghai, the gantry granes are fitted with a double spreader, like this one. 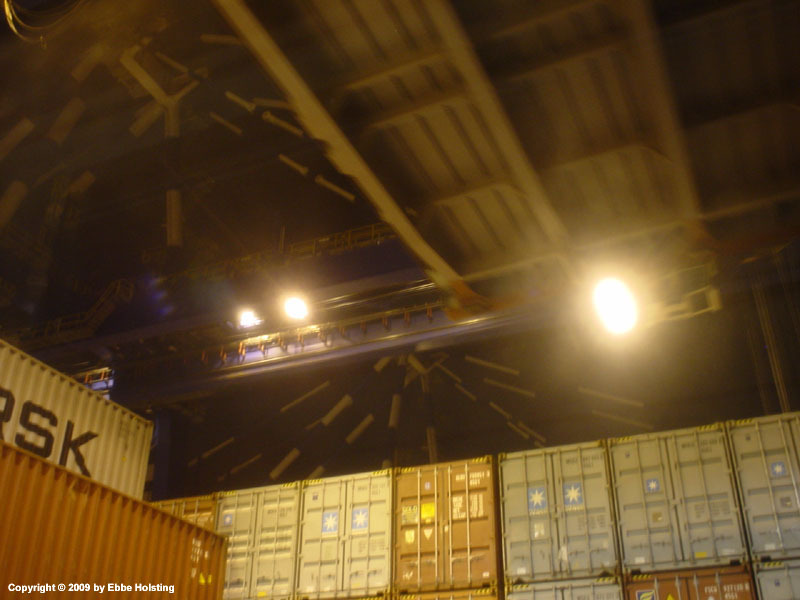 Then they are able to lift two 40-foot containers or four 20-foot containers in one lift, making the cargo operations faster and, consequently, the port stays shorter. Port side hatch has been lifted off, center hatch still in place, loaded up with containers. 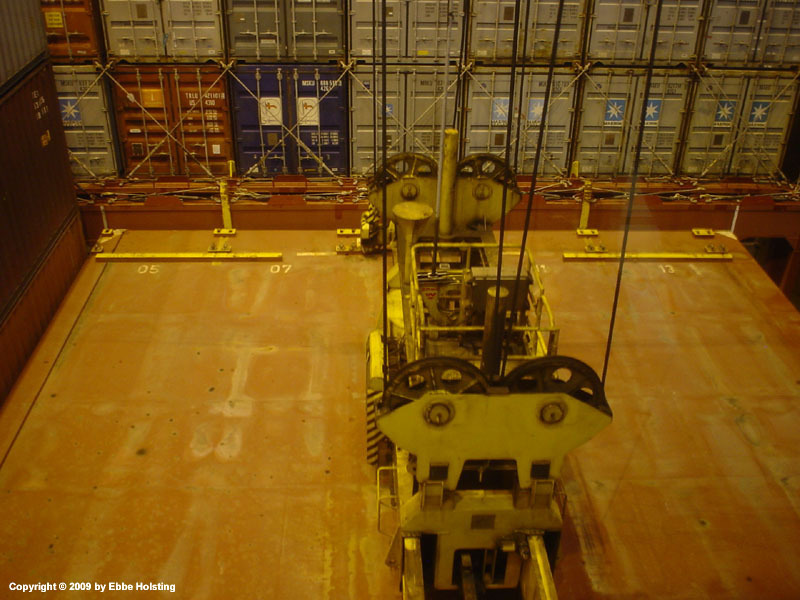 On a larger container vessel, each bay (cargo hold) typically has three hatches. This provides some flexibility when it comes to logistics and where to place containers for different discharge ports. 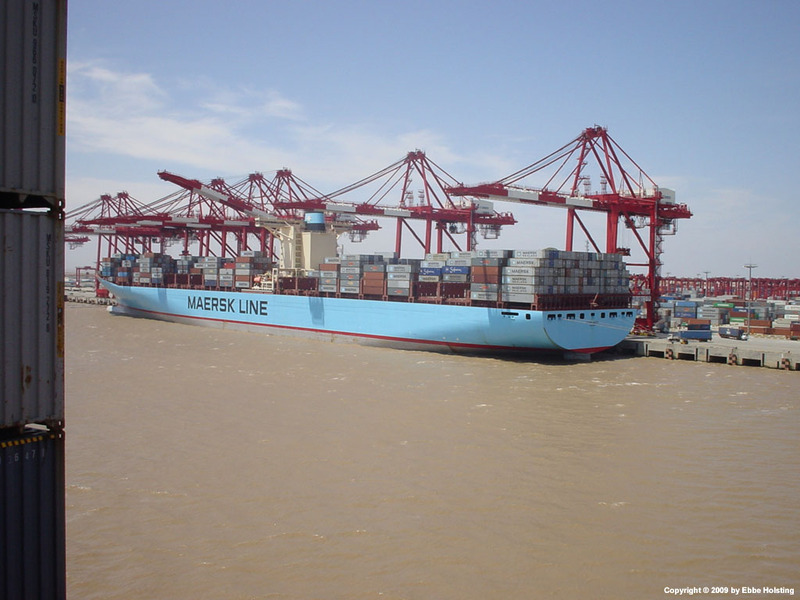 The Eugen Maersk at berth in Shanghai, China. Eugen Maersk is one of A. P. Moller - Maersk's E-Class container vessels and is a sister vessel to Emma Maersk, the world's biggest container ship. Apart from the size difference, the E-Class differ from the A-Class in that the accommodation is located further ahead towards amidship on the E-Class. 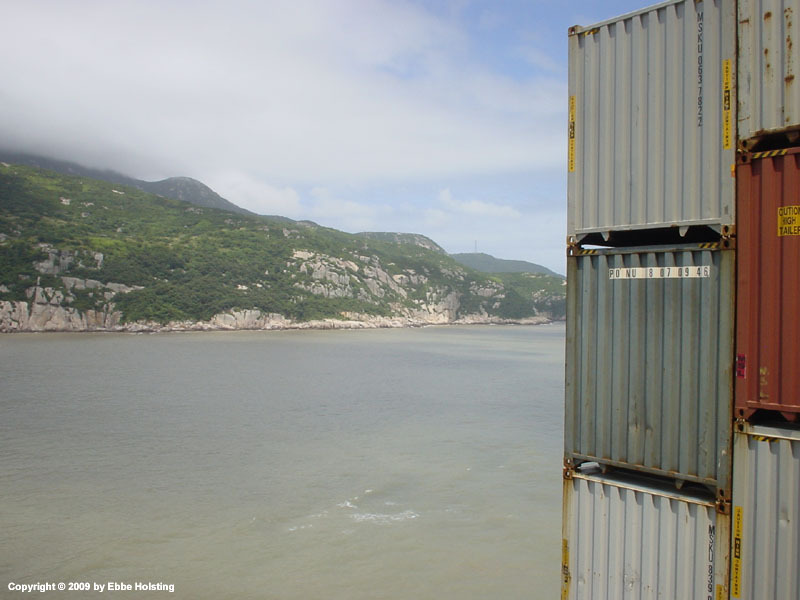 This increases the deck container capacity, as more containers can be stacked in front of the accommodation without impeeding the view from the navigational bridge. 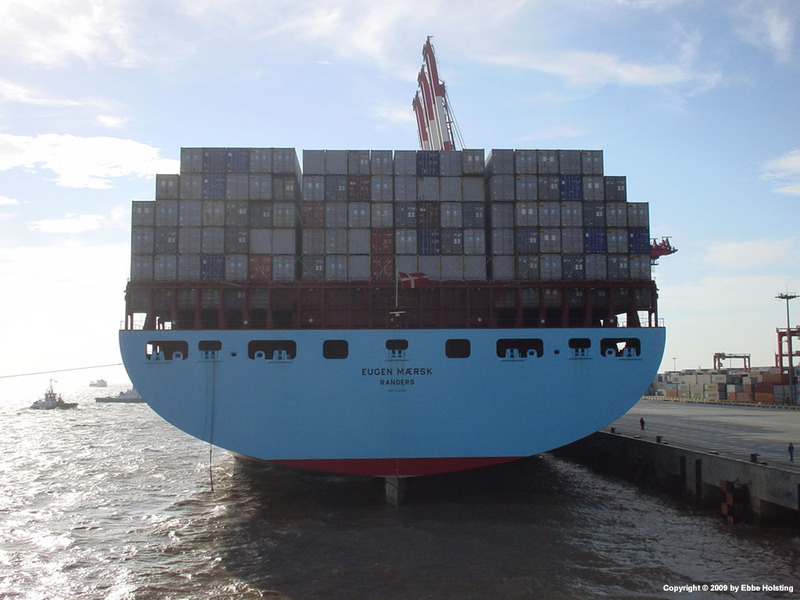 A. P. Moller - Maersk's E-class container vessels are truly an amazing engineering accomplishment. Unfortunately they turned out to be the swan song for Danish ship yard Odense Staalskibsværft (Lindøværftet) which ceased all ship building activities shortly after completing the series. Lindøværftet was built and owned by A. P. Moller - Maersk, and was renowned for its high-quility ship design and building. In the end though, it was unable to compete with the far cheaper ship yards in the far east. 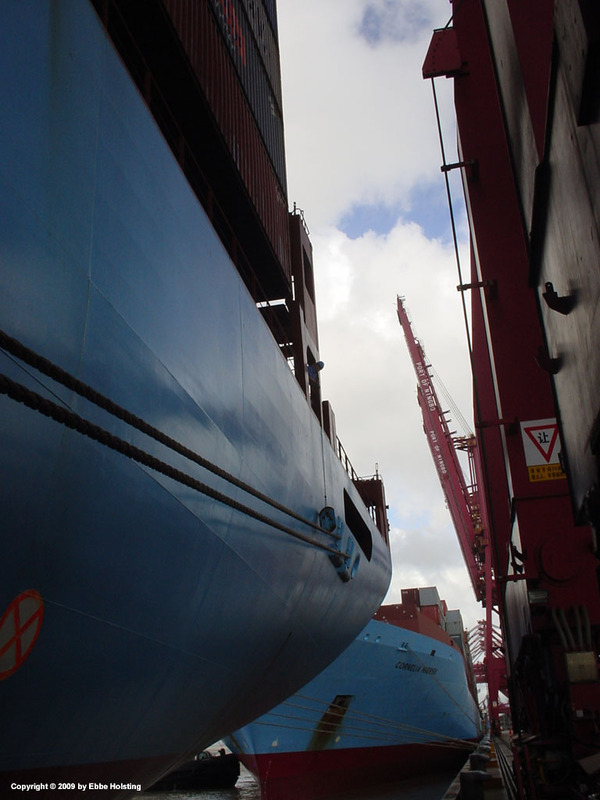 The transom of the Eugen Maersk, preparing to depart Shanghai, China. In the left side of the picture the tugboat towing line is visible, and in the port side of the transom, we see a mooring rope being heaved on board. 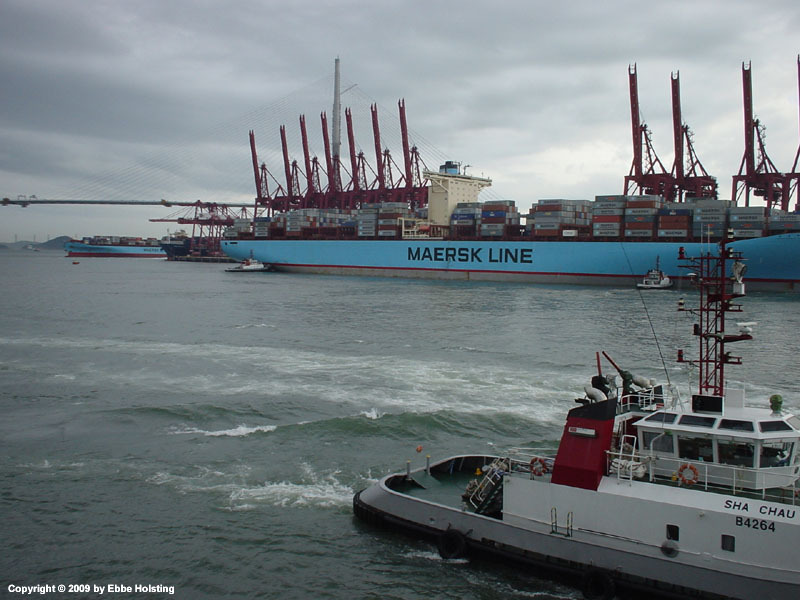 A tugboat assiting the Eugen Maersk during departure from berth. 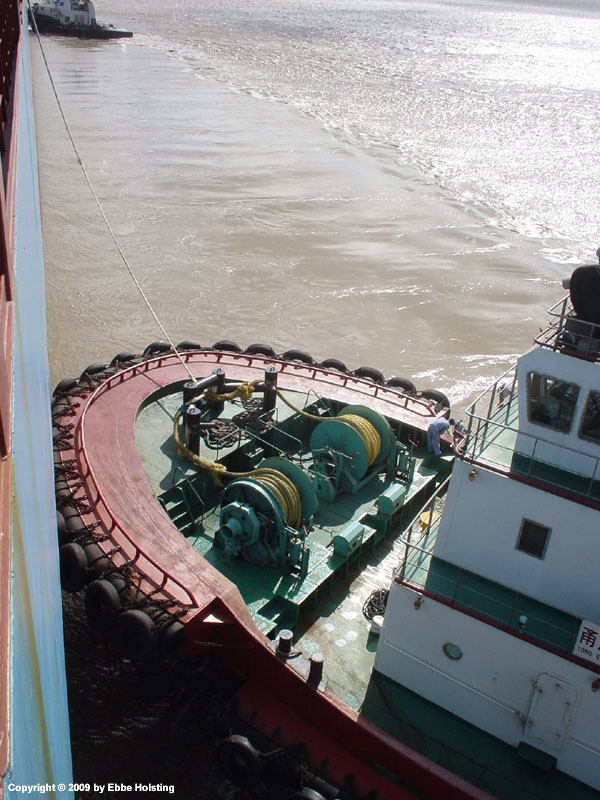 The tug pulls the ship away from the berth and, if needed, assists in turning the vessel around. Tugboats of this size typically have a bollard pull (pulling power) of about 20 to 40 tonnes. Eugen Maersk departing the port of Shanghai, China. Tugboats are used to aid in the manoeuvring of the ship. The Eugen Maersk seen in profile as she departs Shanghai. In the picture, the location of the accommodation is clearly seen to be close to amidship. 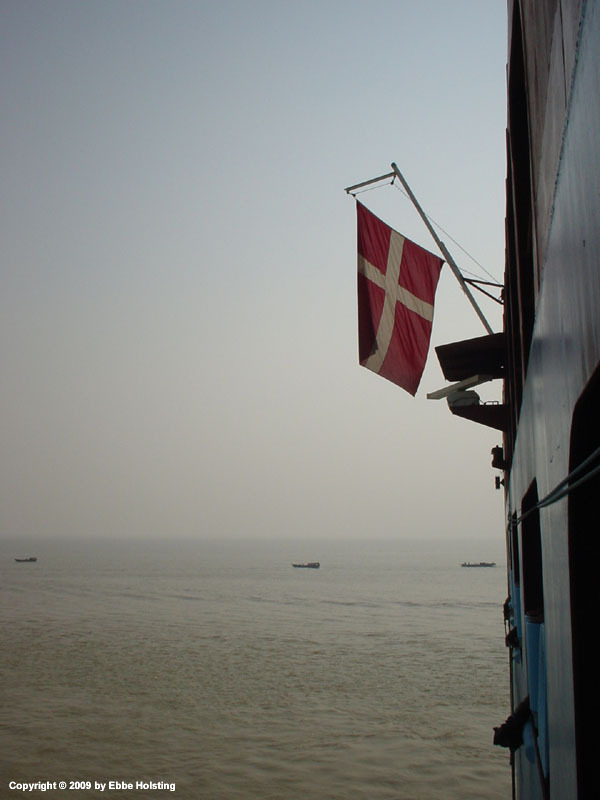 Flying the Danish flag at the stern whilst navigating in Chinese waters. The ship's nationality flag is always flown during daylight hours. Note that the ship is equipped with a radar scanner aft, just below the flag. This is used sometimes during berthing, and when navigating in pirate infested waters in order to look out for small fast-moving boats approaching from abaft. 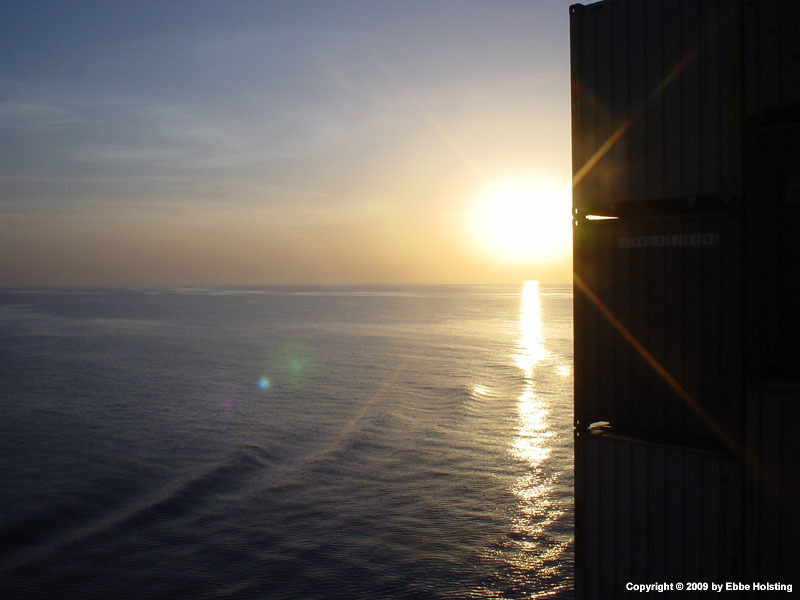 A beautiful evening, with the sun setting over fair seas. Sunsets over the ocean can be absolutely breathtaking, and just as you think they can't get any better, the sun dips just a little bit further below the horizon, and the array of colors change completely, composing an even more beautiful sight. Looking aft from the starboard passageway. You can just make out the Earth's curvature. Or is it just me? Moving to the forecastle to catch another shot of the same sunset. 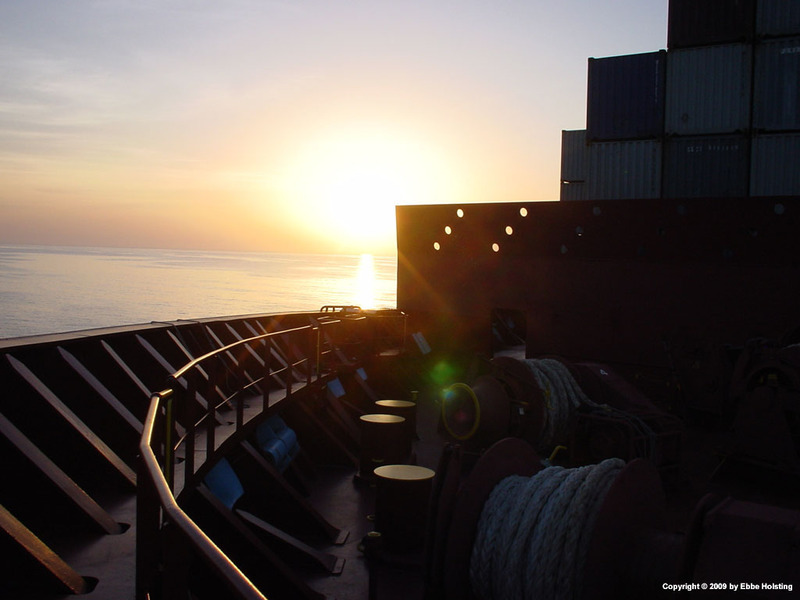 The sun setting over the South China Sea, here viewed from the forecastle (forward mooring deck) of the Axel Maersk. 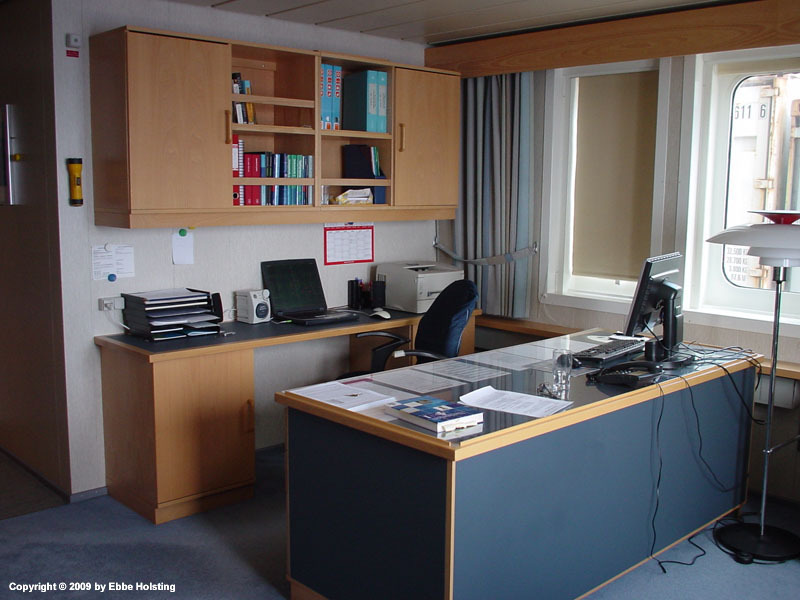 On board large container vessels the forecastle is often the most quiet location, so it is a nice place to come when off-duty for a little relaxation. Light from the setting sun reflecting in the funnel. 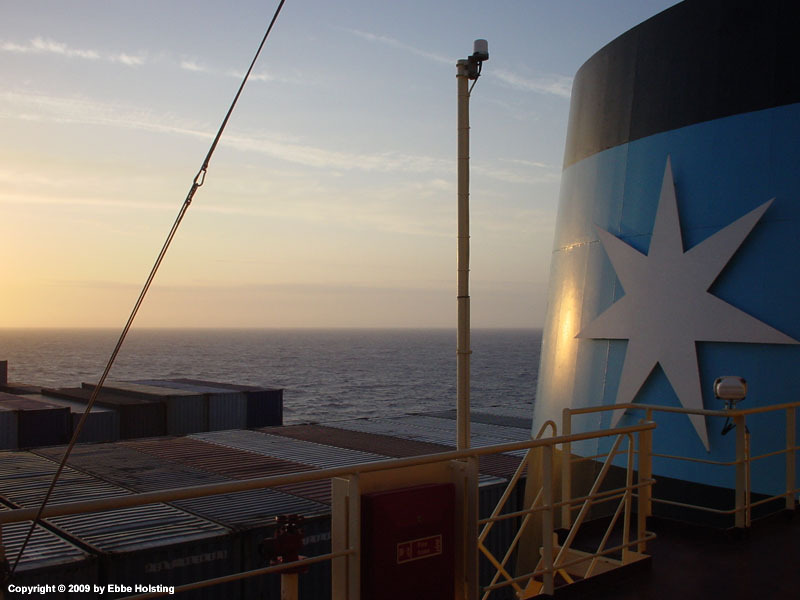 The white 7-armed star on a lightblue background is the logo of A. P. Moller - Maersk. A ship's funnel is traditionally always decorated with the shipping company's logo. Same situation, only this time seen from starboard side. Note the flag line in the left side of the picture. The ship is fitted with a number of flag lines for hoisting the Company flag, local national flags and signal flags. 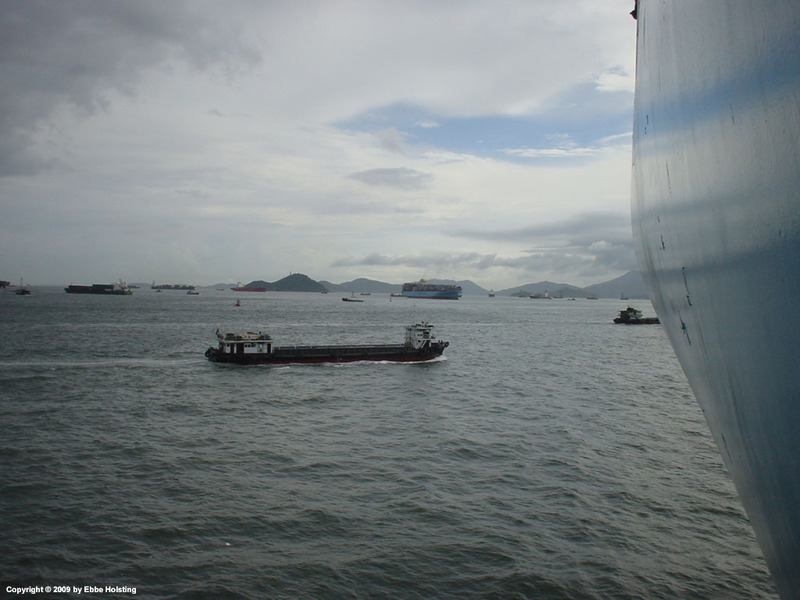 A view from the poop deck (aft mooring deck) during approach to the port of Ningbo, Japan. The control cabinet to the left houses the control levers for the mooring winches. To the right of the cabinet we see three fairleads, the first is of the Panama type, which is used for the tugboat line. The next two are of the Saint Lawrence type and are used for our own mooring ropes. Saint Lawrence fairleads are equipped with rollers for the mooring ropes to bear against, thereby reducing chafing. In this particular situation, we had no containers on the aftmost bay, so there was no "roof" over the poop deck. The hatch in the foreground leads to the steering gear compartment, where the ship's stock of various oil drums (lubricating oil etc.) is also kept. The hatch and boom of course fitted for hoisting drums up and down from the compartment. 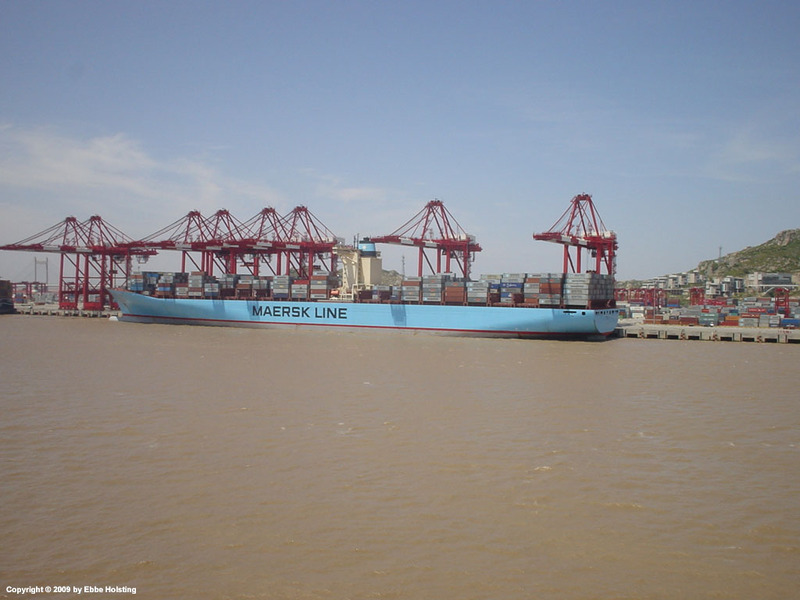 The Cornelia Maersk at berth in Ningbo, China. 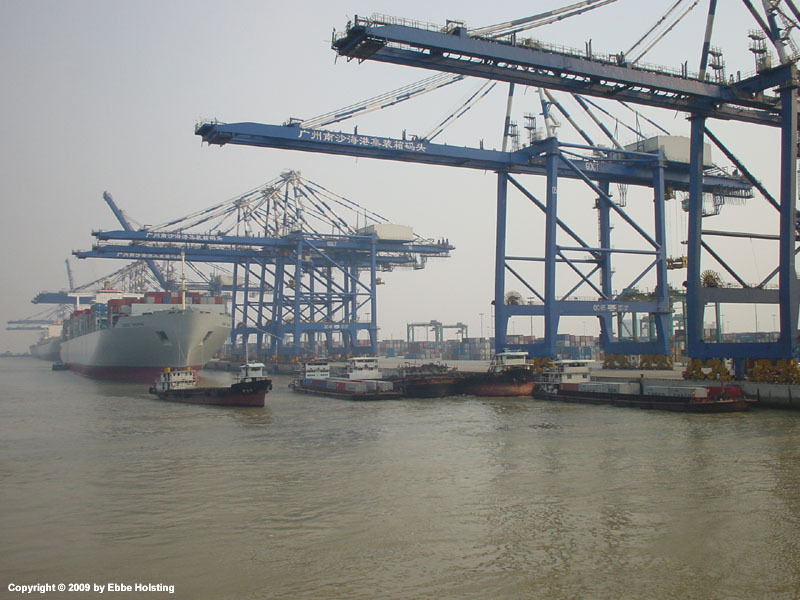 Ports in the Far East are renowned for their efficiency, and it is quite common that the cargo operation on a ship of this size is carried out with up to 8 gantry cranes. 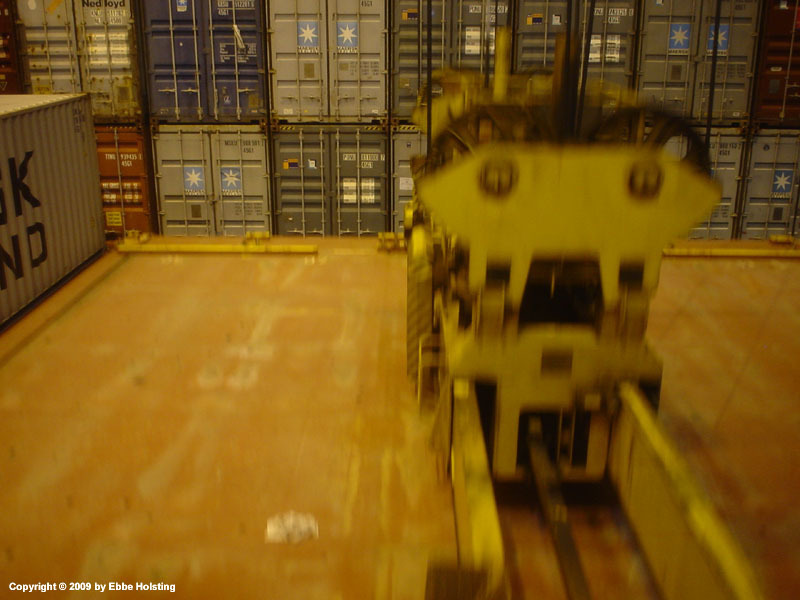 Each crane moves (loads or unloads) about 30 containers per hour, maybe even more if things go well, thereby cutting port stays down to as little as 6 to 10 hours. With the mooring operation completed, rat guards are lowered onto the ropes to inhibit rats from coming on board. The white and orange symbol in the lower left hand corner indicates the presence of a thruster below the water line. This is of course of the ship's stern thrusters. 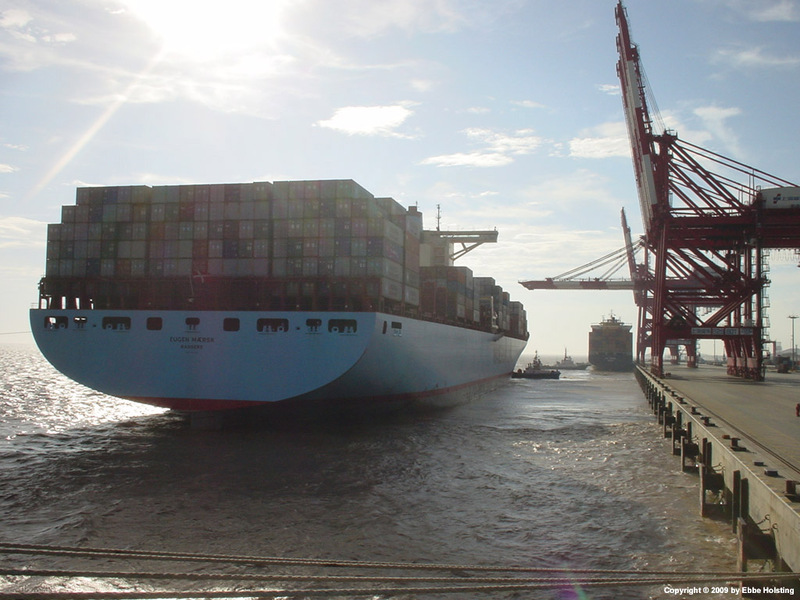 The A-class container ships are fitted with one bow thruster and two stern thrusters to aid in manoeuvring during berthing and un-berthing. Cornelia Maersk getting ready for departure, just after we have arrived. Cornelia is being held in place with help from tugboats while she lets go of her mooring lines. In this picture, only two mooring lines remain, the two forward spring lines. 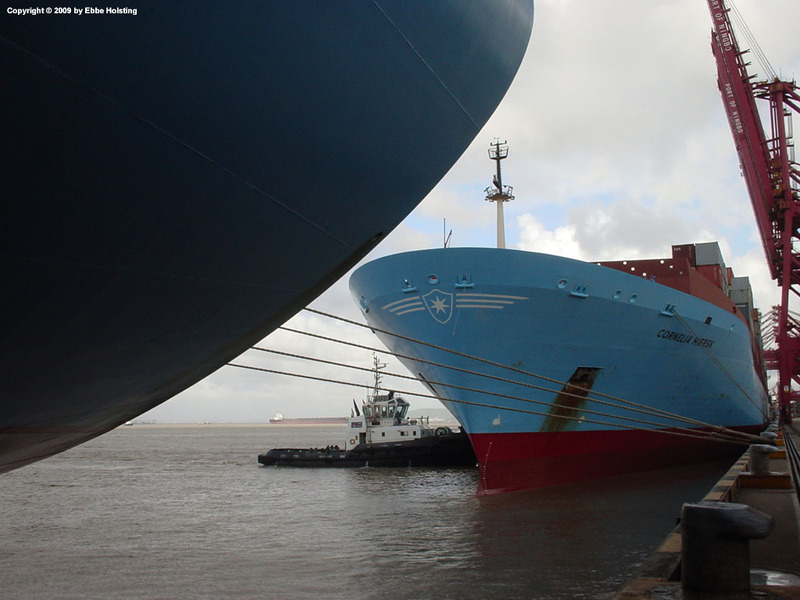 The fore and aft spring lines are typically the first to go ashore during berthing, and the last to go during un-berthing. 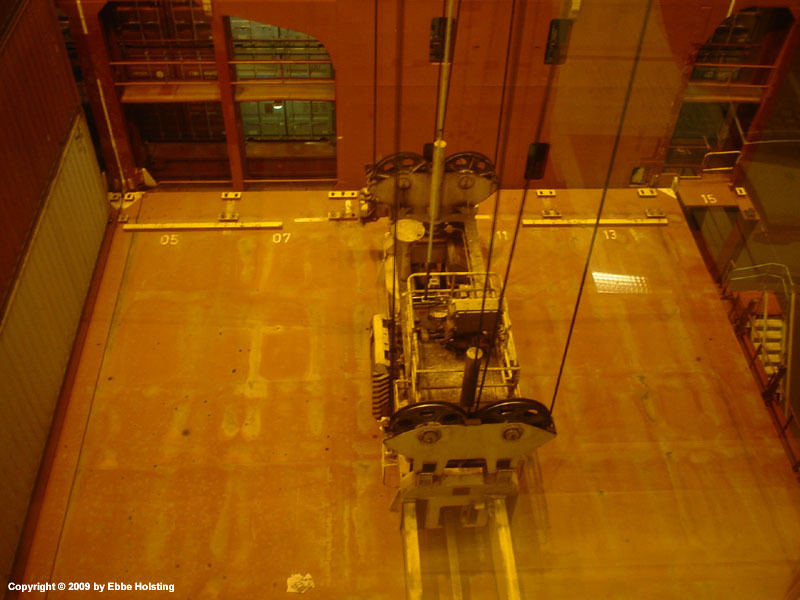 The gantry crane spreader getting in position for lifting off a cargo hold hatch cover. The hatch covers weigh more than 30 tonnes each. The spreader having settled and locked correctly into the lifting sockets starts lifting up the hatch cover. The yellow vertical pads on the lashing bridge guide the hatch up and down, thereby avoiding damge to the lashing bridges and lashing equipment. The hatch cover is now clear of the lashing bridges and near-by containers, and the gantry crane starts moving it back in over the quay. 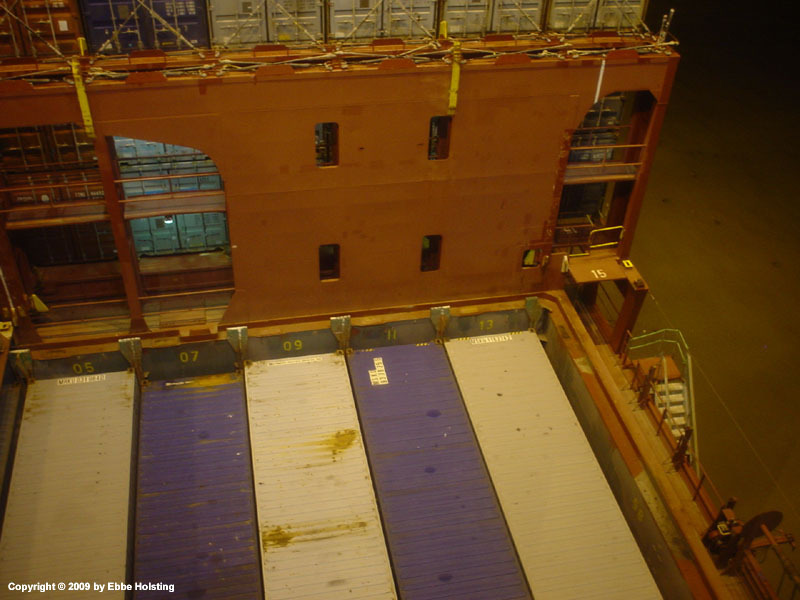 With the hatch cover off, the containers in the cargo hold (here filled to the brim!) can be accessed by the gantry crane. 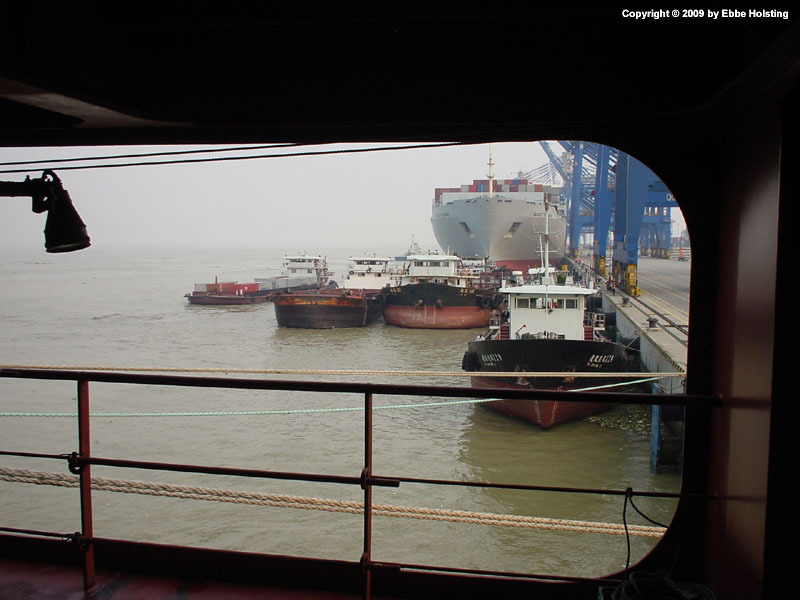 Approaching the berth in Nansha, China. Note the throwing line coiled up and ready in the right side of the picture. When the ships comes within throwing range of the pier, this throwing line is thrown ashore, being attached to the first mooring line. As we passed this container ship during berthing in Nansha, the surge caused by our ship caused some of the mooring ropes of the grey ship to burst. A couple of ropes can be seen hanging losely from the bow. Two tugboats rush to the ship to assist in bringing her back alongside the pier. No damage claims were put in by the vessel though. At berth in the port of Nansha, China. These small river boats are a common sight in China. 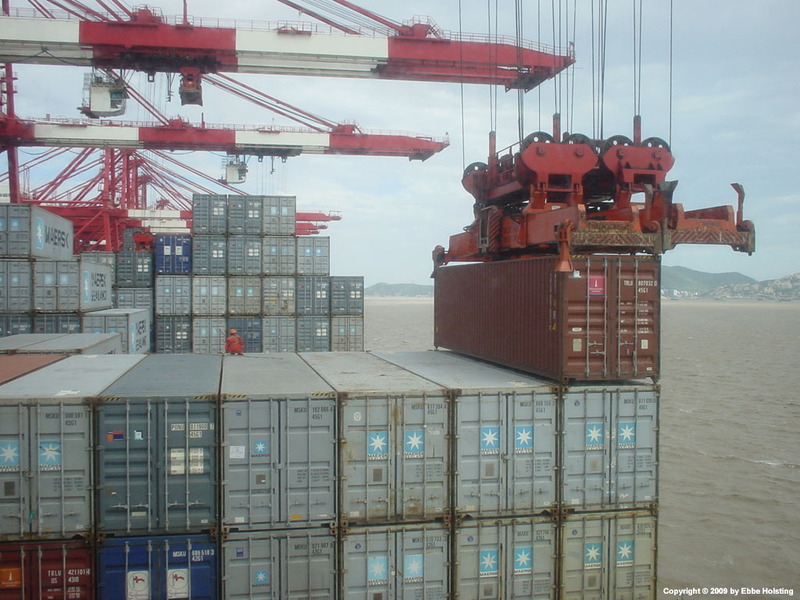 They transport the containers up the rivers to smaller ports, unreachable by large ships. Alongside at Salalah, Oman. 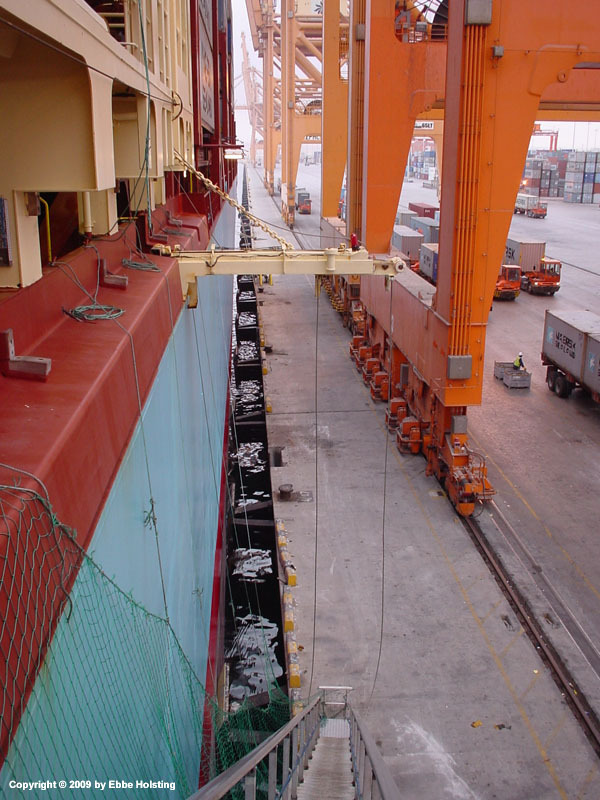 Typical view of the pier during container cargo operations. 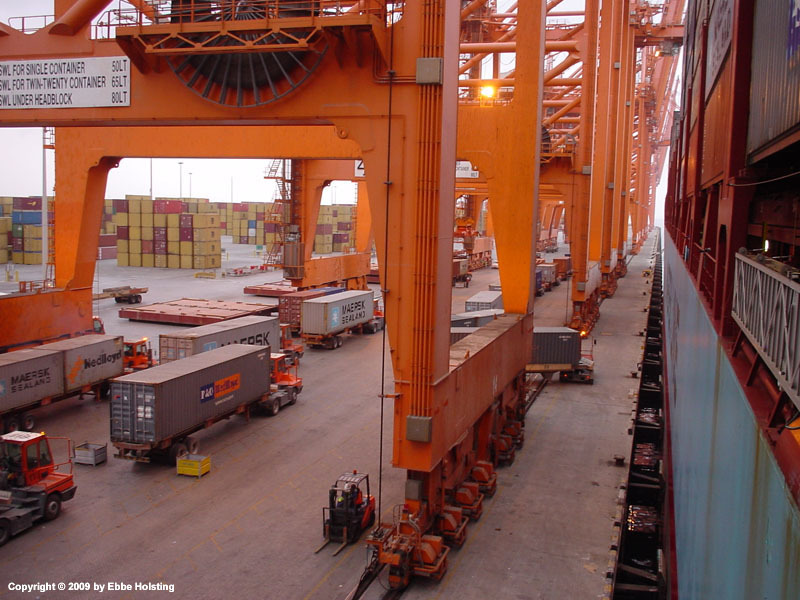 The trucks bring the containers to and from the gantry cranes, and the cranes lift the to and from the ship. 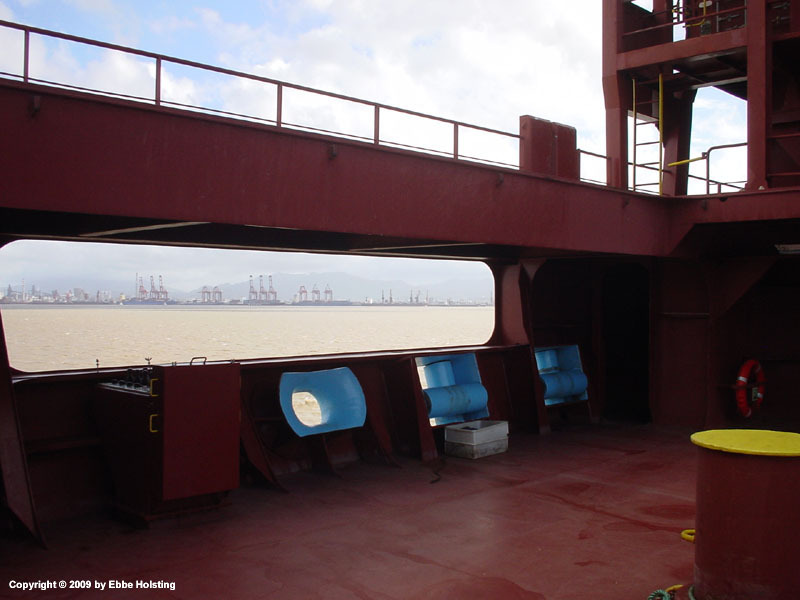 Looking down the gangway ladder whilst at berth in Salalah, Oman. Note how the pier is fitted with rubber fenders against which the ships are moored.